Medical costs abroad can be extremely expensive. Does your insurance apply overseas, including medical evacuation, payment to the overseas hospital or doctor, or reimbursement to you later? You are then referred to their brochure, “Medical Information for Americans Abroad” on the U.S. State Department website. It is an excellent document to read before starting on any overseas adventure. When planning a working vacation it is absolutely critical to check with your local health-care provider to determine exactly what they do and do not cover when living and working abroad, including restrictions on injuries and illnesses, maximum length of stay, and exclusions for the country of residence. If you are one of the lucky few whose health policy includes full international coverage, then no more need be done. (Note: Some international exchange programs, such as Fulbright grants, include health coverage in their benefits.) However, the majority of policies contain significant restrictions or come to a complete and crashing halt at our national borders. In these cases you need to consider purchasing supplemental health-care coverage for you and your family, and a good place to start is HTH Worldwide. Click on their link Travel Medical and International Health Insurance Basics for an excellent introductory tutorial. There are two types of policies: Travel Health Insurance pays for such basics as emergency medical needs, ambulance services, hospital costs, doctor bills, and prescription medicines. In the event of a serious injury or illness requiring specialized treatment, Emergency Evacuation Insurance covers the cost of airlifting you to your home in the United States or to the nearest full-service, first-world medical center, a cost that can run tens of thousands of dollars. You should purchase both types to avoid facing a catastrophically large expense. Some other issues to keep in mind are: 1) Duration. Some policies are capped at thirty, sixty, or ninety days at which point they terminate. Make sure a policy lasts at least as long as your appointment. 2) Primary/secondary coverage. A primary-care policy pays all medical expenses regardless of what other insurance you may have while a secondary policy only covers costs in excess of the amount you will be reimbursed from your existing policies. Primary coverage is an unnecessary luxury if your current insurer will pay a portion of the expenses. 3) Deductibles and co-pays. Like most policies, the more you are willing to pay the cheaper the cost will be. Determine how much you are willing to risk while overseas and then purchase a health policy with the appropriate deductible. The exact cost of a joint travel health/emergency evacuation health policy will vary greatly based on duration, coverage type, and deductibles, as well as your age, family size, and host country. But, as one example, the cost of a policy providing health-care and emergency-evacuation coverage for a forty-something adult living and working in Istanbul, Turkey, is $130-300 per month, depending on deductibles and policy limits. 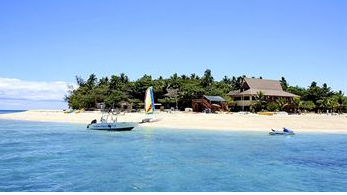 This is not a lot to pay for an important aspect of any working vacation—peace of mind! So, before heading out to Italy, India, or Indonesia, make sure you are fully covered if misfortune does befall. Without it, your “Other Guy’s Dime” working vacation may end up costing you a huge percentage of your own savings. Our three-month working vacation in Istanbul resulted in yet another thoroughly enjoyably social, cultural and professional experience. We made close friends among the faculty as many had studied in the U.S. and were eager to renew professional contacts with American academics. We spent a good deal of time with Albert and the other summer school TAs who let us join them on excursions to local bars and music clubs. Since I taught in the morning, afternoons were free for trips to tourist sites such as Topkapi Palace, Hagia Sophia, and the Blue Mosque, as well as more leisurely activities like riverboat excursions to the Black Sea, meetings with members of the Turkish Jewish community (courtesy of Albert), and a visit to the small village of Kanlica on the Asian side of the Bosporus. According to colleagues Kanlica is famous for making the world’s richest, creamiest, and most delicious yogurt. After traveling there by water taxi and enjoying a bowlful at a local restaurant, we could only agree. Our “yogurt outing” is typical of the delightful, off-the-beaten-path day trips you can take when given adequate time. Kanlica would certainly not be part of the typical four-day/three night “Highlights of Istanbul” packaged tour. Since I did not teach on Friday (I asked the chair to schedule my classes between Monday and Thursday) Ruth and I had time for three-day weekend jaunts to sights farther afield, such as the three thousand-year-old archeological ruins of Ephesus, the volcanic cave homes of Cappadocia, and the beach resort of Bodrum. These tours were purchased from a local travel agent after our arrival and paid for in lira, making them quite inexpensive. 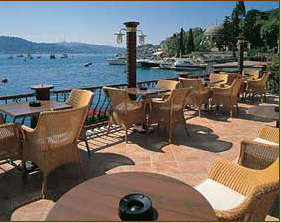 The Riverside Terrace of the Bebek Hotel Near Campus Where We Spent Many A Pleasant Evening. 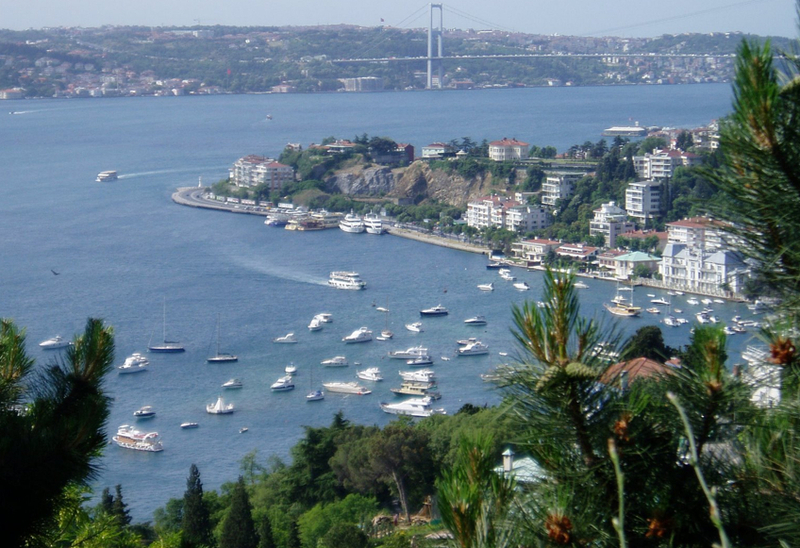 Many days we would not go into the central city but, instead, sit on the lovely outdoor terrace of the Bebek Hotel, walking distance from campus and overlooking the Bosporus. We would sip coffee (in the morning) or enjoy a glass of wine and a plate of meze (in the evening) watching river traffic sail by and the setting sun illuminate the Asian side of the straits. To learn about a country and its people most visitors, ourselves included, head off to museums, historical sites, churches, mosques, and parks. Food, however, is an important component of culture, and a cooking class can be an entrée into a different aspect of a country’s history and traditions. Turkish food, although not as well-known to American palates as French, Italian, or Chinese, has influenced eating habits throughout the Mediterranean. My wife and I signed up for a cooking class that included not only cooking instruction—and eating, of course—but also an introduction to local agriculture, shopping habits, and Turkish mealtime rituals. When thinking about how to use the extended time provided by a working vacation, consider not only the sites listed in The Lonely Planet but also some less well-known introductions into the traditions, habits, and customs of your host country. This includes not only cooking classes, but courses on language, dress, music, and traditional crafts; visits to people’s homes; sporting events; involvement with a local religious community; volunteering at a neighborhood school; or assisting at a community center or senior citizen home. It is difficult to participate in these types of activities on a tightly scheduled packaged tour, but they fit quite comfortably into a working vacation whose duration is measured in months not days. Colleagues and neighbors, as well as the Web, are good sources of information on how to locate and sign up for classes, home visits, community activities, and volunteer opportunities. And finally, when deciding what kind of cultural experience you might wish to have, be adventurous and thoroughly unconventional, like my wife who signed up for one of the more unusual aspects of Turkish culture–at the Serap Su Belly Dancing Academy of Istanbul! This is not the post I originally planned to put up–that one will appear in a few days. Instead, it is an emotional response to the embarrassingly bad and thoroughly unrealistic “chick flick” Eat Pray Love and its relationship to what I am trying to accomplish in this blog. Although the two may seem quite different, there are a number of unfortunate parallels. In the movie a privileged Manhattanite divorces her husband and sets off on a worldwide search for enlightenment and self-discovery. 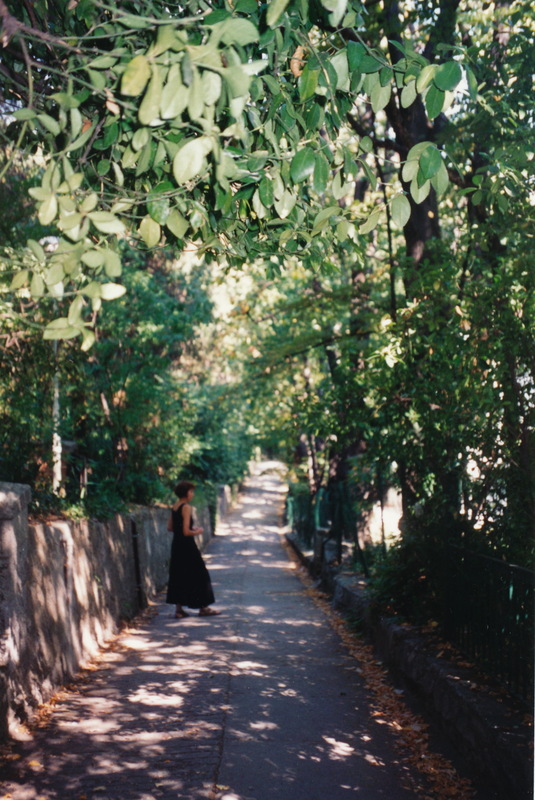 She rents a lovely apartment in Rome, one of the most expensive cities in the world, meditates in an Indian ashram, and winds up in a luxurious home on the island of Bali. Nowhere, though, is there any mention of how she is paying for this voyage of self-discovery, a year-long odyssey whose out-of-pocket costs would probably run more than $100,000. Furthermore, in the movie the heroine deals only with such problems as zipping up her jeans after a few too many pasta and pizza dinners, while in real life recently divorced women spend far more time fighting over shared assets, coping with anger, and stressing about how to pay the bills. OK, why am I being so harsh on this Hollywood pot boiler? Why dwell on what is nothing more than an excuse to spend a couple of hours munching popcorn while enjoying some lovely scenery? The answer is that the unrealistic fantasies of Eat Pray Love are being reproduced daily on hundreds of travel blogs scattered across the Internet. Like the Julia Roberts character, many of us dream about spending time on a tropical island paradise or in a Himalayan hideaway, and there are many sites that feed these fantasies–stories of people (I call them “privileged nomads”) who quit their job, sell the house, kiss friends and family good-bye, and set off around the world. However, when you dive into their “About Me” page you often discover they are either 1) independently wealthy, 2) have come into a significant windfall, 3) are living off the largesse of parents or exes, or 4) are knowingly denuding their life savings. Since most of us do not fall into any of these categories we erroneously conclude that our fantasy of living and working overseas is an unattainable dream; something that happens only in B-movies and to the “other guy.” Unfortunately, that skepticism spills over to other places, including this blog. After reading about my working vacations in London, Sydney, Jerusalem, Nairobi, and Istanbul they believe that, while enjoyable to follow (the blog equivalent of a B-movie), they could never have the kind of adventures described in these posts. My passion for travel writing is to convince you that living and working in some exotic, overseas locale is not an unrealistic goal and not a scriptwriter’s fantasy. If you are a professional with a marketable skill, e.g., doctor, nurse, lawyer, teacher, banker, business person, engineer, scientist, artist, etc., there are many host countries eager to exploit your skills by offering temporary employment for periods ranging from one month to one year. And, unlike Julia Roberts, by earning enough money to cover most or all of your travel expenses you need not be a lottery winner, rolling in alimony, or the scion of a wealthy Wall Streeter to fulfill your dreams. As I wrote in Getting Out of That Rut, one fact that is quite clear to me is there is no shortage of working vacation opportunities, only a shortage of the motivation needed to go after them. I hope you will read this blog with a different attitude from the one you had watching Eat Pray Love. I have no desire to write popcorn escapism, and my goal is not simply to entertain you with fun stories–reading someone else’s adventures may be a pleasant diversion, but it is nothing like the thrill of experiencing those same adventures for yourself. I hope you will read the current and future posts on this blog with the sincere belief that these adventures are not something that happen only to the “other guy” but, instead, represent a life style choice available to anyone with the drive and energy to make it happen. As Michael has stated many times, you never know for sure where or when a short-term employment opportunity will unexpectedly appear. For me it happened on a visit to Cyprus that morphed from a brief pleasure trip into a working vacation. My initial plan was to go for a holiday, but I ended up falling in love, finding a job, and extending my stay to six months. The friendly people and the gorgeous sights grabbed my attention and would simply not let go. 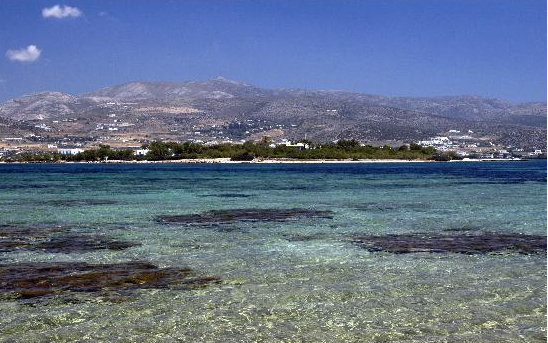 Cyprus is filled with both natural beauty and old-world charm. 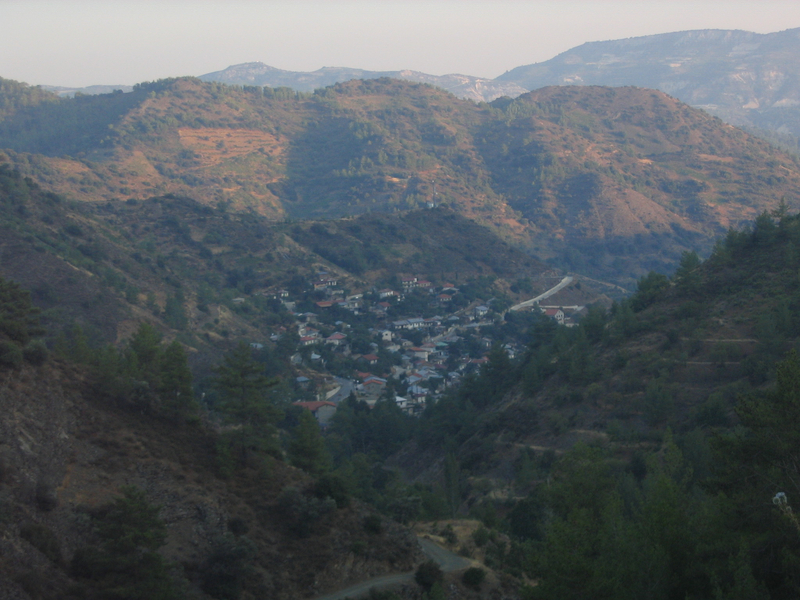 I spent the majority of time living and working in the picturesque village of Treis Elies in west-central Cyprus. This tiny town is surrounded by mountains, vineyards, hot springs, fruit arbors, and wildflower trails. Near the end of my visit I spent about one week seeing other parts of the island and found that its tourist regions are, like most Mediterranean destinations, crowded, noisy, and similar to other island getaways. Therefore, I spent most of my time in the regions surrounding Treis Elies enjoying hikes along high mountain passes, long walks through lush orchards, and leisurely meals with friends and family. Before I went to Cyprus I had been living in New York. It was a tough employment year, and I needed a break from the stress. I had been a marketing consultant as well as a part-time language instructor teaching an after-school Greek class in the city. In Cyprus, I would often while away the hours in my relative’s coffee shop enjoying the sun as it peered through the makeshift grapevine “roof.” One day a man walked onto the patio and took a seat next to me. He was the director of a program in the local school that taught English to children in the immediate area. After telling him I was a part-time Greek teacher he offered me a position because of my background in teaching a second language. Overall, that six month working vacation was an eye-opening cultural and social revelation. Even though I grew up in a home with Cypriot parents, I was fairly ignorant of the culture and mores of my ancestral homeland. My parents had been in America for about ten years before I was born and had started the process of acclimatizing to American norms and behavior. 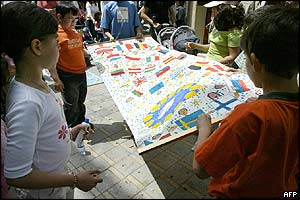 My Cypriot background, like those of many second-generation immigrant children, was rapidly fading. Spending a few weeks lounging on a beach could not begin to eliminate that cultural ignorance, but a six-month working vacation certainly would. The people of Treis Elies, especially the children, took me in and taught me a great deal about their world, a world far more relaxed and tightly knit than the stressful, anonymous life of a megalopolis like New York. It was as if I had been transplanted from a large open forest into a tiny garden where everyone shared the same space. Ultimately, as a teacher it became more about what the students were teaching me of Cypriot life than about the English lessons I was giving them. Sadly, after six months the program closed, and I decided to head back to America. However, that working vacation experience and my memories of this trip will stay for a lifetime.. I return to Cyprus every so often when I want to relax and see friends and family. I currently work for OneTravel (a company offering Cheap Tickets) as a travel writer using my life experiences as inspiration for my articles.